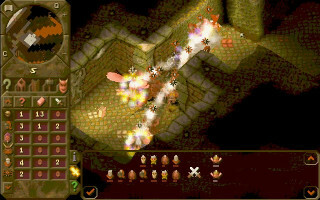 I was hired at Bullfrog to program the Saturn version of Dungeon Keeper in June '96. I was the only person on this version, working closely together with the PC team. At the time the PC version of DK was still in active development, so I had a lot of catching up to do. I got a graphics engine running pretty quickly, which, by the way, turned out pretty good on the Saturn because of its quad renderer (instead of the now usual triangles). The Saturn's forward rendering method also meant that roof corners were completely smooth surfaces instead of jagged triangles. However, I had only been working on the Saturn version for a few months when it was canned. I don't think the game was ever close to running on the Saturn. 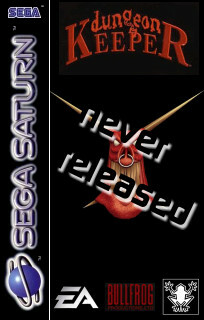 When the Saturn version was canned I began working on the Playstation version, which was later dropped simply because it was deemed infeasible due to the game's memory requirements on the PC. As the Saturn version only got as far as displaying a level in third person and first person perspective plus a minimap in the corner of the screen and nothing else - no gameplay, no creatures, no menus or anything, I would say the version was 10% complete.